This class will school you in the skills needed to tie flatwing baitfish imitations for Puget Sound fly fishing, and beyond. This style of tying incorporates the use of saddles hackles tied in flat along the hook shank and the notion of combining various colors to achieve the desired look in a fly. The style was developed by Kenney Abrams, an east coast striper fisherman, who needed a way to tie striped bass flies that had lots of movement and reflected the way baitfish actually look in the water. The result of his efforts was the flatwing style of tying. We fish primary patterns in different sizes to imitate sand lance, pacific herring and sculpin. The flies fish well on a floating or clear intermediate line. You will learn to tie a few patterns including Ray's fly, which teaches you to work with bucktail. Several others will follow each increasing in complexity. 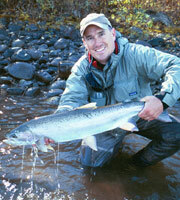 Materials for this class will be provided by The Avid Angler. Participants need to provide their own tools and tying thread. These are tricky tying techniques so we recommend fly tying experience to get the most out of this class. Hope you can join us! I want to thank you for putting on two great classes in tying flatwing flies. It was great to have you start with the history and your personal experience of tying and fishing flatwings in Puget Sound. The first night set the stage with Ray's Fly and the Orange Stimulator (this is a flatwing in attractor colors, ed.). The refresher to start night two helped cement the foundation for tying in this style. I am excited about the sculpin, herring and sand lance. They are attractive patterns and I can visualize how the colors and movement of the feather wings and tail will do a great job imitating bait fish in salt water. I greatly appreciated your teaching style. You were patient yet provided very helpful critiques of our efforts. I know that my experience working with you will make me a better tier. I look forward to sharing the end product but am most excited about the prospect of getting out and testing these flies in Puget Sound.